In 1913, having read of the activities of Frank Lloyd Wright, Robert van 't Hoff decided to see this American architect's work for himself. 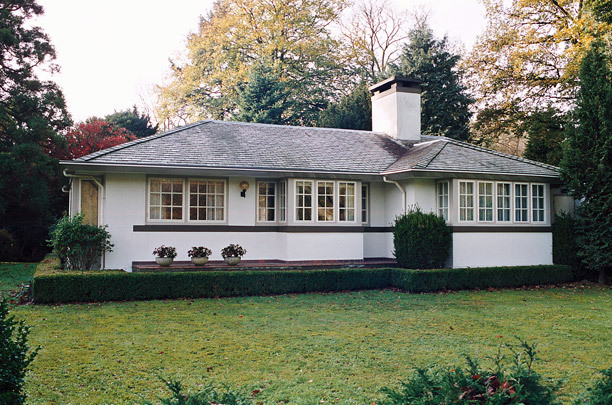 On his return to Holland he designed in 1915 the Verloop summer residence which displays great similarities with Wright's prairie houses. The main features are its overpowering horizontality, emphasized by a low cantilevered roof, and the use of such elements as grey plinths and bands, plant boxes, terraces and bay windows. Van 't Hoff's fame rests almost entirely on his design for a villa for the Henny family. Illustrative of his traditional designs is the Løvdalla house of 1911.